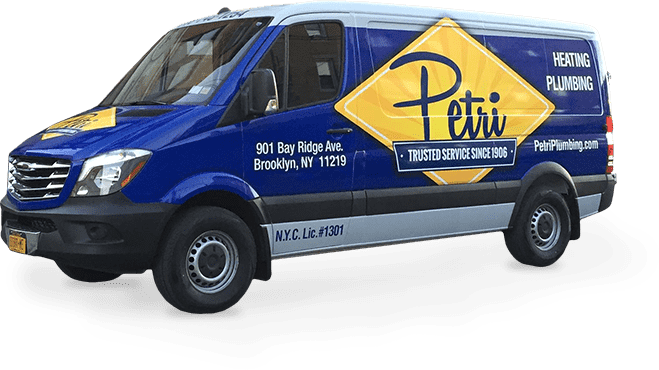 Petri Plumbing & Heating, Inc. has been providing unparalleled, fast, reliable, and guaranteed service to families and businesses in Brooklyn since 1906. Our longevity is an indication of the tremendous value, quality service and customer satisfaction that we have provided to our customers throughout the years. We are licensed and certified by Green Plumbers USA. We are the first licensed green plumbers in New York City and we strive to raise the bar on green plumbing and heating services throughout Brooklyn and its surrounding boroughs. In order to maintain our commitment to our customers, our staff routinely undergoes training to stay abreast of the latest technology and innovation in our industry. 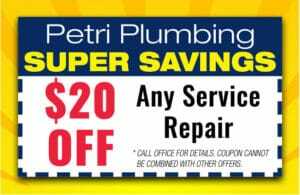 The Petri Family loves serving it’s customers almost as much as it loves a good deal! As a thank you for reading about our company, we’d like to extend a SUPER SECRET OFFER TO YOU! This is only available from this page, so thanks for reading about us and choose from one of these special deals as a way to say thanks! 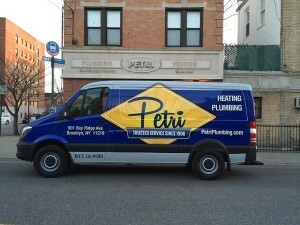 Why Choose Petri Plumbing & Heating, Inc.? We provide a 100% peace-of-mind, trouble free guarantee or you will not pay. Guaranteed straight forward pricing. You approve the price before we start the job.We respect your home. Special care is taken to protect the beauty of your home during any of our expert installation and/or repairs. Petri Plumbing & Heating, Inc. is an environmentally-conscious company — we recycle and reclaim. To ensure 100% customer satisfaction, our highly reliable and professionally trained staff undergoes ongoing training to stay on the cutting edge. Emergency plumbing repair components are always in stock in our custom designed rolling warehouse on wheels. We do things the right way, always. All installations are always performed as per manufacturer’s specifications. We offer preferred scheduling for all our Petri Priority Customers. We are certified by Green Plumbers USA and are Green Screened certified so we can best protect the integrity of the environment we live in. We are an EPA approved Water Sense Partner which enables us to bring you the most advanced State of the Art plumbing fixtures. We are also EPA Lead-Safe certified. Need a reliable plumbing and heating company with four generations of experience? Call us today at 718-748-1254. We are confident you will notice our professional, friendly, and eco-conscious approach to plumbing and heating in Brooklyn.